This is the second year that the World Affairs Council of Oregon asked Portland Urban Beekeepers (PUB) to host a delegation from the middle east. Last year we hosted a group of Government Agricultural Agents from Afghanistan and we felt it an honor to contribute toward their understanding of American honey bee management practices. 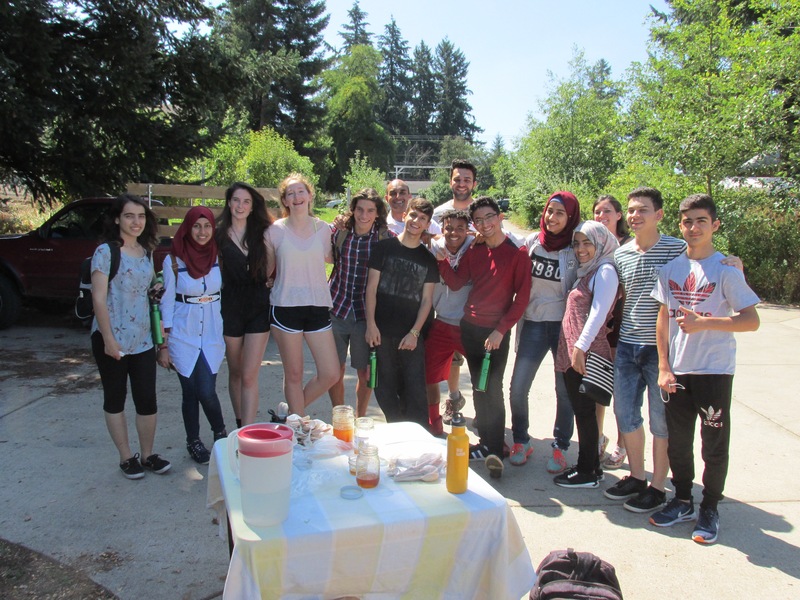 This year, when approached by the Council to host a group of teenagers from Iraq, we felt extremely privileged to be able to help the next generation become, if not beekeepers, then young professionals who understand the role of beekeeping in the world. It is currently being revived, so hosting teenagers from Iraq transcended cultural, theological, and language barriers. One look at the innocence on the faces filled with hope created an atmosphere for these students to experience first-hand apiculture in the U.S. The Iraqi Young Leaders Exchange Program (IYLEP) is one of the many exchange programs the State Department administers each year to strengthen people-to-people relationships between Iraqis and Americans. It enables Iraqi and U.S. high school students and adult mentors to develop leadership skills and build action plans to strengthen the future of Iraq and the U.S. 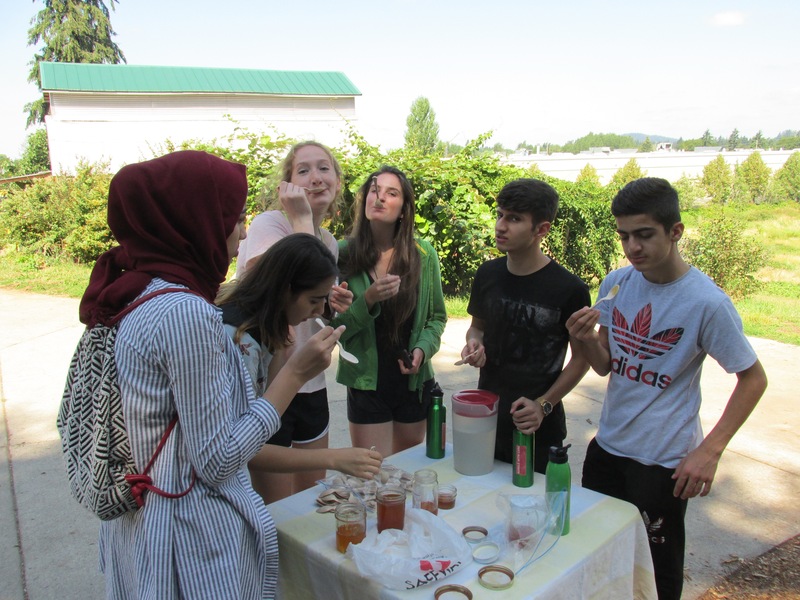 The students on the IYLEP were introduced to new skills and networks through participation in community service activities and leadership workshops, interactions with U.S. students, and site visits to civic, youth, and governmental organizations. The group was comprised of students from Kurdistan and Iraq. Throughout the four-week program, the seven Iraqi youth participants were accompanied by seven U.S. high school students and two Iraqi adult mentors. The group spent one week in Vermont, came to Portland Oregon for two weeks to emerge in environmental stewardship and cross-cultural leadership opportunities, and then will move on to Washington D.C. The moment the group exited the bus at Zenger Farm their faces displayed excitement coupled with a bit of anxiety about meeting the apis mellifera ‘face to face’. Lily Glaeser gathered the group around the apiary for a short discussion on honey bee casts, drone congregation areas, plant pollination, nectar, and of course bee stings. 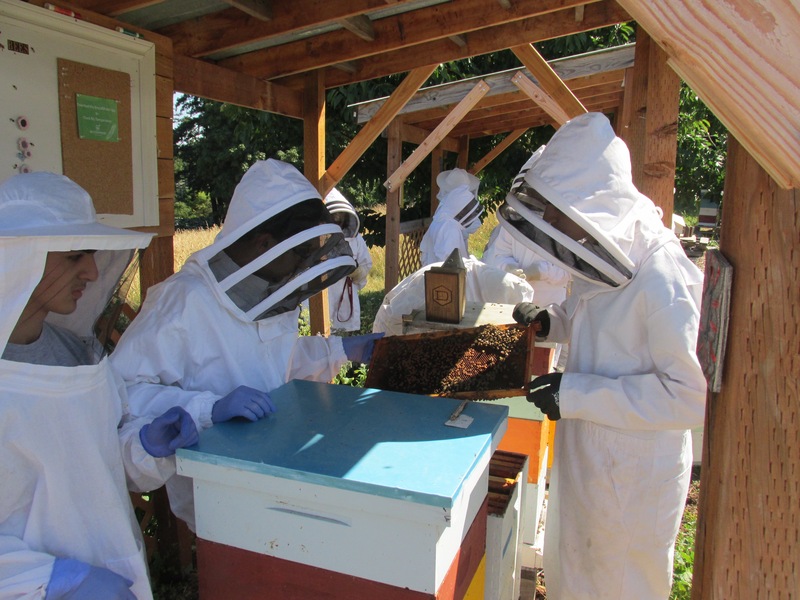 None of the students had prior apiary experience. Yet the students challenged the PUB presenters with insightful questions throughout the experience dealing with beekeeping management techniques and the honey bee. PUB Members then broke the students into smaller groups delving into the hives to witness first hand hive activity and frames. Each ‘hive PUB mentor’ turned their hive tool over to the students to enhance their personal experience. The expression of joy was evident as they lifted frames of capped honey, capped brood, pollen, and nectar. Although fully suited, each smelled the hives’ honey and propolis all the while discussing the virtues of their apitherapy qualities. As the treatment of gout with honey is popular in their region it became a topic of discussion (Najafi, Tahereh Eteraf-Oskouel and Moslem) as did honey’s and propolis’s inhibitory effect on bacteria. The members began to take covers off Langstroth Hives in search of the queen. Then rapidly moving to the upper box where each handled frames in exploration of the intricacies of hive populations and their interactions. Being August only a few drones were evident, but when found the drone was picked up by the student to have an up close feel. Each PUB mentor brought the hives inner-workings into the personalized time. One of the hives was experiencing Idiopathic Brood Disease Syndrome (Oregon State University insect ID Clinic, Oregon State University) allowing a great opportunity to visualize hive disease. Iraq’s existing hives, according to a report by Sanders in 2005 have 10% and 40% Varroa mite infestation. Due to time constraints, discussion on treatments of this devastating issues did not transpire. When one of the students came away from the hive with a dozen of the girls on her finger, it became clear a bond, as we have all acquired, was fermented. Watching each of the group’s zeal as they held up frames, picked up drones, smelled the honey and propolis, and observed the bees on each frame proved the benefit of this occasion. While standing around the table, an open discussion of the morning’s events transpired. “What is swarming?” “How long does it take the hive to recover from a swarm?” “How do queens mate?” And more. This culminating forum was evidence of the impact the morning’s experience was for these eager minds. Allie Collopy, representing World Affairs Council of Oregon, at the end of the morning shared how excited the group was about their activities in the apiary. Thank you, IYLEP high schoolers, for all that you gave us. And thank you, World Affairs Council of Oregon and the State Department, for making it possible.